The set for the hit sitcom Cheers was inspired by photographs of Tom Kershaw's Bull and Finch Pub on Beacon Street in Boston, MA. This made Kershaw a rich man and it made the Bull and Finch the first stop on many a travelers' itinerary. But some tourists left disappointed at not seeing something closer to the TV version of the pub. 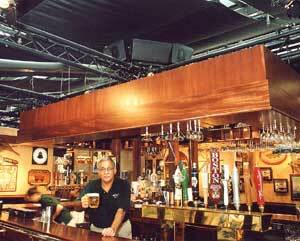 To satisfy this hunger, Kershaw opened Cheers at Faneuil Hall Marketplace in August of 2001, a bar and restaurant featuring items used by cast members and a scaled-down version of the set. The project went from demolition to opening in about six weeks. Shaun Crossen, sound systems manager at Shanahan Sound & Electronics said, "Mr. Kershaw owns a few places in the city and has used our systems and services before. He looked over our plans, hired us and we were installing everything within two weeks. He knows Shanahan's reputation and I think the fact we were recommending JBL professional products put him at ease. Everyone knows the JBL name and they have great warranties." Kershaw insisted on a system that would give him maximum flexibility and ease of use. Cheers not only caters to tourists during the day, but also serves the needs of locals: neighbors, area business people and those looking for night life. The sound system serves Cheers four distinct areas: the downstairs pub, the upstairs conservatory, the bar and the outdoor cafe. Some might say Cheers has transcended itself as a physical space, that it's a mind state of community and gruff, honest camaraderie. Now that its inspiration and imitation are open for locals and tourists alike, there's a chance to catch some of the magic that made the television show great.